Mars Hydro has been a premiere led grow light manufacturer since 2009. 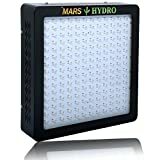 All Mars lights will be tested for 48 hours before shipping, to make sure each light in its perfect conditionDescription : High Output 5W LEDs Perfect for vegetative and flowering cycles Superior yield and higher quality flowers Large heat sinks, high efficiency Save power on electrical and cooling 10 Bands Spectrum of Light: 450~475nm 620~630nm, 650~660nm, IR((Looks little bright, do not think they are defective Led), and white LED Output Power:180pcs*5watt Actual power consumption range 110v:445w+/-5%; 220v:440w+/-5% Dimension:420x420x90mm Black painted casing. Lifespan: 50000-100000hours View Angle of leds: 90/120°Mixed Worldwide Voltage: AC85~265V Package Include: 2 pieces 900w led grow light/Power cord/Steel hanging kit We will pack you the Plug according to your country needed. Usage tips : Recommended Lighting Time: Vegetative Stage: 14-18 hours on .Flowering Stage: 10-12 hours on. Recommended Coverage: 3.5*3.5ft(Veg), 3*3ft(Flowering) Just indoor gardens and greenhouses use only. NOT intended for outdoor use. Mars Hydro has been a premiere led grow light manufacturer since 2009. 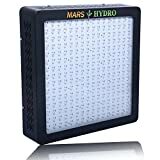 All Mars lights will be tested for 48 hours before shipping, to make sure each light in its perfect conditionDescription : High Output 5W LEDs Perfect for vegetative and flowering cycles Superior yield and higher quality flowers Large heat sinks, high efficiency Save power on electrical and cooling 10 Bands Spectrum of Light: 450~475nm 620~630nm, 650~660nm, IR((Looks little bright, do not think they are defective Led), and white LED Output Power:240pcs*5watt Power consumption: 110V : 595W ; 220V : 580W Dimension:460x460x90mm Black painted casing. Lifespan: 50000-100000hours View Angle of leds: 90/120°Mixed Worldwide Voltage: AC85~265V Package Include: 2 pieces MARSII 1200 led grow light/Power cord/Steel hanging kit Usage tips : Recommended Lighting Time: Vegetative Stage: 14-18 hours on .Flowering Stage: 10-12 hours on. Recommended Coverage: 4*4ft(Veg), 3.5*3.5ft(Flowering) Just indoor gardens and greenhouses use only. NOT intended for outdoor use. Mars Hydro has been a premiere led grow light manufacturer since 2009. 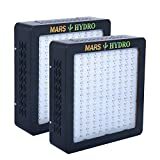 All Mars lights will be tested for 48 hours before shipping, to make sure each light in its perfect conditionDescription : High Output 5W LEDs Perfect for vegetative and flowering cycles Superior yield and higher quality flowers Large heat sinks, high efficiency Save power on electrical and cooling 10 Bands Spectrum of Light: 450~475nm 620~630nm, 650~660nm, IR((Looks little bright, do not think they are defective Led), and white LED Output Power:140pcs*5watt Power consumption: under 110V: 334W-340W; 220V: 326-330W Dimension:380*380*110mm Black painted casing. Lifespan: 50000-100000hours View Angle of leds: 90/120°Mixed Worldwide Voltage: AC85~265V Package Include: 2 pieces MARSII 700 led grow light/Power cord/Steel hanging kit We will pack you the Plug according to your country needed. Usage tips : Recommended Lighting Time: Vegetative Stage: 14-18 hours on .Flowering Stage: 10-12 hours on. Recommended Coverage: 3*3ft(Veg), 2.5*2.5ft(Flowering) Just indoor gardens and greenhouses use only. NOT intended for outdoor use. Mars Hydro has been a premiere led grow light manufacturer since 2009, pays all attention on developing safe and high quality full spectrum light for worldwide personal indoor growers and commercial crops. Have own research, design, development, production and testing teams to support great productsAll Mars lights will be tested for 48 hours before shipping, to make sure each light in its perfect conditionDescription : High Output 5W LEDs Equivalent to HPS/MH/HID: 800W With Dual Veg/Flower spectrum, also have veg and bloom switches Perfect for vegetative and flowering cycles Superior yield and higher quality flowers Large heat sinks, high efficiency Save power on electrical and cooling Specification of Light 10 Bands Spectrum of Light: 430~440nm, 450~475nm 620~630nm, 650~660nm, IR((Looks little bright, do not think they are defective Led), and white LED Output Power:324pcs*5watt Actual Power: 710W/110v; 702W/220v Lumen: 110v: 44678umen; 220v: 45189umen Noise Level: 61.4DB Coverage Area: 4.2'×4.2'(1.28m×1.28m) Product Size(L/W/H):WJ229541453GB N.W. : 31.09lbs /14.10KG G.W. : 35.43lbs /16.07KG Voltage(AC): 85-265V Amp Draw: 5.92A/110v, 3.15A/220v Black painted casing. Lifespan: 50000-100000hours View Angle of leds: 90/120°Mixed Package Include: 1 piece MARSII 1600 led grow light/Power cord/Steel hanging kit We will pack you the Plug according to your country needed. Usage tips : Vegetative Stage: 14-18 hours on .Flowering Stage: 10-12 hours on. Hanging Distance: Germination: Germination: 60-76cm(24''-30''); Veg:45-60cm(18''-24''); Flowering:30-45cm(12''-18'') Just indoor gardens and greenhouses use only. NOT intended for outdoor use. Mars Hydro has been a premiere led grow light manufacturer since 2009. 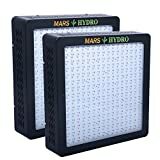 All Mars lights will be tested for 48 hours before shipping, to make sure each light in its perfect conditionDescription : High Output 5W LEDs Perfect for vegetative and flowering cycles Superior yield and higher quality flowers Large heat sinks, high efficiency Save power on electrical and cooling 10 Bands Spectrum of Light: 450~475nm 620~630nm, 650~660nm, IR((Looks little bright, do not think they are defective Led), and white LED Output Power:240pcs*5watt Power consumption: 110V : 595W ; 220V : 580W Dimension:460x460x90mm Black painted casing. Lifespan: 50000-100000hours View Angle of leds: 90/120°Mixed Worldwide Voltage: AC85~265V Package Include: 5 pieces 1200w led grow light/Power cord/Steel hanging kit We will pack you the Plug according to your country needed. Usage tips : Recommended Lighting Time: Vegetative Stage: 14-18 hours on .Flowering Stage: 10-12 hours on. Recommended Coverage: 4*4ft(Veg), 3.5*3.5ft(Flowering) Just indoor gardens and greenhouses use only. NOT intended for outdoor use. 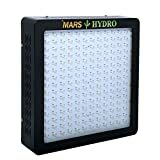 Mars Hydro has been a premiere led grow light manufacturer since 2009, pays all attention on developing safe and high quality full spectrum light for worldwide personal indoor growers and commercial crops. Have own research, design, development, production and testing teams to support great productsAll Mars lights will be tested for 48 hours before shipping, to make sure each light in its perfect conditionDescription : High Output 5W LEDs Equivalent to HPS/MH/HID: 450W With Dual Veg/Flower Spectrum, also Veg and flower switches are included Perfect for vegetative and flowering cycles Superior yield and higher quality flowers Large heat sinks, high efficiency Save power on electrical and cooling Specification of Light 10 Bands Spectrum of Light: 450~475nm 620~630nm, 650~660nm, IR((Looks little bright, do not think they are defective Led), and white LED Output Power:180pcs*5watt Actual Power:390W/110v; 386W/220v Lumen: 110v: 20108umen; 220v: 19792umen Noise Level: 57.8DB Coverage Area: 3.5'×3.5'(105cm×105cm) Product Size(L/W/H): 16.5''×16.5''×3.5''(42×42×9cm) N.W. : 19.20lbs /8.71KG G.W. : 22.29lbs /10.11KG Voltage(AC): 85-265V Amp Draw: 3.25A/110v, 1.754A/220v Black painted casing. Lifespan: 50000-100000hours View Angle of leds: 90/120°Mixed Package Include: 1MARSII 900 piece led grow light/Power cord/Steel hanging kit We will pack you the Plug according to your country needed. Usage tips : Vegetative Stage: 14-18 hours on .Flowering Stage: 10-12 hours on. Hanging Distance: Germination: Germination: 60-76cm(24''-30''); Veg:45-60cm(18''-24''); Flowering:30-45cm(12''-18'') Just indoor gardens and greenhouses use only. NOT intended for outdoor use. Mars Hydro has been a premiere led grow light manufacturer since 2009. 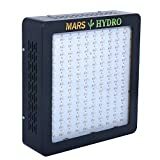 All Mars lights will be tested for 48 hours before shipping, to make sure each light in its perfect conditionDescription : High Output 5W LEDs Equivalent to HPS/MH/HID:350W With Dual Veg/Flower Spectrum, also Veg/ Bloom switches are added to this light. Perfect for vegetative and flowering cycles Superior yield and higher quality flowers Large heat sinks, high efficiency Save power on electrical and cooling Specification of Light 10 Bands Spectrum of Light: 450~475nm 620~630nm, 650~660nm, IR((Looks little bright, do not think they are defective Led), and white LED Output Power:140pcs*5watt Actual Power: 307W/110v; 306W/220v Lumen: 110v: 14764umen; 220v: 14307umen Noise Level: 58DB Coverage Area: 3'×3'(92cm×92cm) Product Size(L/W/H): 15''×15''×3.5''(38×38×9cm) N.W. : 14.64lbs /6.64KG G.W. : 17.53lbs /7.95KG Voltage(AC): 85-265V Amp Draw: 2.471A/110v, 1.358A/220v Black painted casing. Lifespan: 50000-100000hours View Angle of leds: 90/120°Mixed Package Include: 1 piece MARSII 700 led grow light/Power cord/Steel hanging kit We will pack you the Plug according to your country needed. Usage tips : Vegetative Stage: 14-18 hours on .Flowering Stage: 10-12 hours on. Hanging Distance: Germination: Germination: 60-76cm(24''-30''); Veg:45-60cm(18''-24''); Flowering:30-45cm(12''-18'') Just indoor gardens and greenhouses use only. NOT intended for outdoor use. Mars Hydro has been a premiere led grow light manufacturer since 2009. 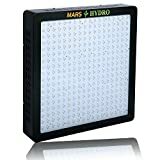 All Mars lights will be tested for 48 hours before shipping, to make sure each light in its perfect condition Features Full spectrum for ultimate flowering and vegetative plant cycles. With true 5 watt Epistar chip, the Mars II 900 replace a 450W HPS Rugged case design, heavy gauge heat sinks, dual ball bearing fans and quality led chips. Specifications Model: Mars II 1200 LED Grow Light HID Replacement: 600W HPS LEDs Brand: Epistar LEDs Quantity: 240pcs Spectrum: white, 450~475nm, 620~630nm, 650~660nm IR 730nm(invisible to human eye, please wear sunglasses to check.) Give your plants their ideal spectral ratios from seed straight to harvest. True Watts: 509W/220v Flowering Power: 335 watts Veg Power: 178 watts Amperage(Veg+Bloom): 2.27A@220v Lumen: 26,010 lm/220v Footprint: 4¡¯¡Á4¡¯(122cm¡Á122cm) Noise Level: 60.4DB(decibel) Panel Size: 46*46*9cm Net Weight:25.31lbs /11.48KG View Angle of leds:90/120 degree mixed Lifespan: 50,000~100,000 hours Plug-in service. No risky ballasts or reflectors needed. Safety Guaranteed: CE and RoHS certified. Plug has passed safety standard. VDE in EU, BSI in UK. Usage Tips Lighting Time: veg: 18h/6h(on/off) or 20h/4h(on/off); flower: 12h/12h(on/off) Suggested Hanging Distance: Seedling:?60cm?Germination:?60-76cm?? ?Veg:?45-60cm?Flower:?30-45cm Application: Full cycles growing; indoors only Package Includes 1pcs Mars II 1200 led grow light 1pcs Free hanging kits 1pcs Free power cord. Mars Hydro has been a premiere led grow light manufacturer since 2009. 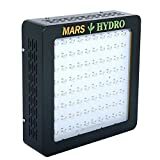 All Mars lights will be tested for 48 hours before shipping, to make sure each light in its perfect conditionDescription : High Output 5W LEDs Equivalent to HPS/MH/HID:250W With dual veg/flower spectrum, also veg and bloom switches are added recently. Perfect for vegetative and flowering cycles Superior yield and higher quality flowers Large heat sinks, high efficiency Save power on electrical and cooling Specification of Light 10 Bands Spectrum of Light: 450~475nm 620~630nm, 650~660nm, IR((Looks little bright, do not think they are defective Led), and white LED Output Power:80pcs*5watt Actual Power: 187W Lumen: 110v: 7859lumen; 220v: 7821lumen Noise Level: 58DB Coverage Area: 2.5'×2.5'(76cm×76cm) Product Size(L/W/H): 13.4''×13.4''×3.5'' (34×34×9cm) N.W. : 11.82lbs /5.36KG G.W. : 14.18lbs /6.43KG Voltage(AC): 85-265V Amp Draw: 1.437A/110v, 0.78A/220v Black painted casing. Lifespan: 50000-100000hours View Angle of leds: 90/120°Mixed Package Include: 1 piece MARSII 400 led grow light/Power cord/Steel hanging kit Usage tips : Recommended Lighting Time: Vegetative Stage: 14-18 hours on .Flowering Stage: 10-12 hours on. Hanging Distance: Germination: 60-76cm(24''-30''); Veg:45-60cm(18''-24''); Flowering:30-45cm(12''-18'') above plants Just indoor gardens and greenhouses use only. NOT intended for outdoor use.